In Japan, people first signed their names in regular script (kaisho). 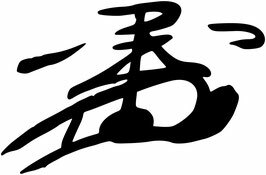 In time people started signing in cursive script (sōsho) , and the end result was a complete stylisation of one’s name which beame know as a kaō. The oldest Japanese example of a kaō dates to the middles of the 10th centrury. In the 11th century people starting taking one part of each of two Chinese characters (kanji) of their name and combining them in a stylised fashion. This was the birth of the ‘nigōtai’ (two-part combination) style of creating a kaō. In the same period the ‘ichijitai’ (one stylised character) style of creating a kaō first appeared. 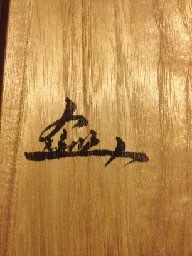 This style takes one of two Chinese characters (kanji) of a person’s name and stylises this single character to create a kaō. 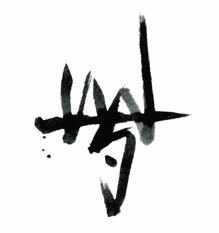 In each of the styles, the kaō is used as a substitute for the person’s signature, and the kaō is created from the characters of the person’s real name. Kaō were first used by aristocrats, but were being used by common people by the end of the 11 century (for examples in documents stating the sale of rice paddy land). A charactersistic of the use of common people was that they often signed their full name as well as signing their kaō (a kaō is a substitute for a person’s signature, so just one would have sufficed). From the Kamakura Period (1185-1333) the amount of documentation produced by the samurai (warrior class) made a marked increase. The use of kaō by the samurai class increased accordingly. The samurai developed their own characteristic ways of creating a kaō, different from the aristocrats. This was called ‘bukeyō’ (warrior style), and the aritocrat’s style ‘kugeyō’. Originally kaō were developed from the person’s name, but from the Kamakura Period the samurai started taking the kaō used by their ancestors and lord and adapting these kaō for their own use. Another characteristic was the samurai followed the custom of the common people of the Heian Period (794 - 1185) by signing both their names and kaō together. It was usual for the samurai to have a delegate compose a document and the person dictating the document only sign with their kaō. This custom meant that samurai documents were determined as genuine or not according to the kaō signed on the document. In contrast, the documents of aristocrats were determined as genuine according to handwriting. By the Sengoku Era (Warring States Era) kaō had become more and more creative. Kaōs were developed without any reference to the person’s original name. For example, Oda Nobunaga (name characters 織田信長) used the character 麟 to develop his kaō, Toyotomi Hideyoshi (豊臣秀吉）used the character 悉 and Date Masamune (伊達政宗) used 鳥 (sekirei). The inheritor of a family would use their former father’s or family head’s kaō, and in this way the kaō can be seen as not only signifying a person, but also a particular rank or status. Kaō carved out of wood and stamped with ink can be seen in use from the Kamakura Period, but from the Sengoku Period their use increased significantly, and even more widespread during the Edo Period. These wooden ‘kaōgata’ made the kaō into another official seal. In the Edo Period inkan seals started to replace the use of kaō and the use of kaō started to decline. In 1873 any documents not certified with a registered personal seal could not be considered as evidence in a court of law. This meant that although kaō were by no means banned, their use declined dramatically as they were superseded by personal seals (inkan). Overtime problems emerged with the law of recognising documents as genuine only if stamped with a personal seal, and the 1873 law was replaced. From the Meiji Period and to the present day a custom has existed in in Parliamentary Cabinet meetings of using kaō for Ministerial signatures. As kaō are rarely used in everyday life, this custom means Ministers often have a kaō created for the first time when they assume office. In 21st century Japan kaō are sometimes used for passport and credit cards signatures, company memos, and government approvals etc. However, the use of kaō is extremely rare as personal seals are more convenient.